I'm not sure how many people use mudbot any more, but we've got some great coders, so it's worth a shot! I want mudbot to echo a line 'You have reached your destination" when I hit the room I pathed to, just like the IG path finding system does for trigger purposes. I can't imagine it'd be too terribly difficult since mudbot already has the `echo functionality, but I haven't the slightest idea which file to be playing with, or where I'd be tweaking what. EDIT: Looking at the files in Notepadd++ is just... wow. I don't want to touch anything I'm not 100% sure of. @Aldric I haven't really gone into mudbot too much, but what you're looking at is a DLL file, it's encoded, and any modifications that are made to it will likely break it. I think you'll likely want to work in main.c. 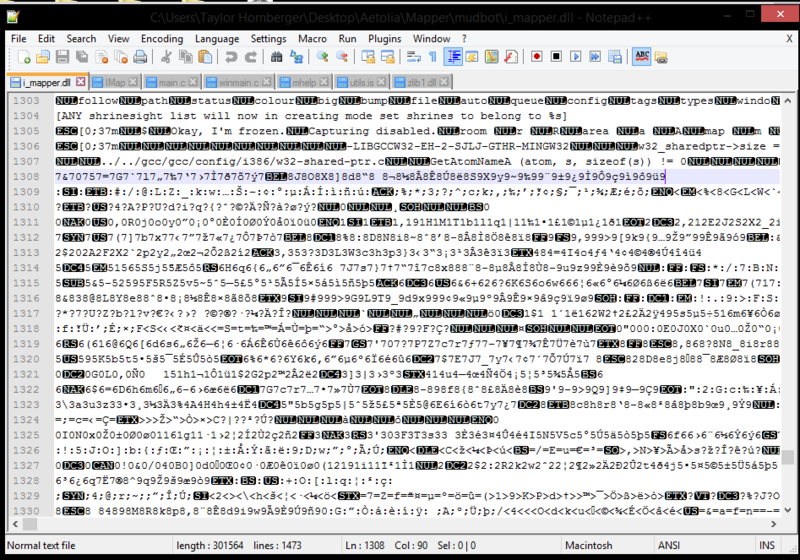 You have to go into Xons C files which he has in the same thread I believe and edit them and encode them etc. You cant really edit the mudbot files only 1 or two, Imap and config..
Also. WHy not just make a trigger in ya system? Much easier no? (Done.) == is normally the line you can trigger off.. I... somehow missed the (Done.) line. Thanks for that! Problem solved! From an earlier question, I have a better one now. How do I know this is faster than running a string.gmatch ".-": ".-" on that same PI? Or a gmatch a similar, short rex.new? From there, it's a simple procedure of seeing which method takes the least time. This is a shame for one main reason -- JSON is a format designed specifically to deliver information in an accessible and human-readable way. Matching it as regex sets you up for your GMCP parsing to break any time we add, remove, or even change the order of GMCP entities. If I could recommend an alternative, look at a library for converting JSON into native Lua tables, similar to what Mudlet does with its gmcp. table. Snipped to defer to Keroc's awesome reply below. I'll look into it and test it for efficiency against a gmatch. Just to touch on Oleis' reply, MUSHclient comes with a distrubuted JSON package that you can easily load into your code without much of a hassle. You can find it in the lua/ subdirectory of your install path called json.lua. Then all you need to do is load the package using 'require' and use accordingly. If you want to trim the fat you can even just load the decoder module and skip the rest as the encoder/whatever else probably isn't very useful for you. I gotta figure out JSON first, because the linked page and file makes no sense to me. I don't know Java or JScript. Having one less thing to download would be nice, and I'll learn around what MUSH distributes. Thank you Keroc. The original addon that was distributed somewhere around here for GMCP use in MUSH used JSON, and I made a whole new addon just to avoid learning all the language the original author utilized; I can't edit what I don't understand, and it wasn't doing things I needed it to do. anyone know how to convert this from a black box on a screen into a transparent one or something as it is blocking a section of my screen and UI stuff is new to me. The parameters are r, g, b, transparency - 0 being fully transparent and 0,0,0 being the color black. You'd probably be better off moving using moveWindow("WhoHere",xCoordinate,yCoordinate). There may be a function to set your foreground's transparency - I couldn't find it, but I imagine it's available through setStyleSheet. Hey, so. I'm about to undergo the dubious task of updating Tripwire. Which will mostly involve gutting Tripwire, I imagine. I like Tripwire's GUI, and I think I can update the tracking to work with the new information the discernment line gives you. Maybe? I don't know, I haven't the first idea of how to code anything at all. Could anyone give me a clue on what I should maybe not delete before I just go on a spree? All the coding clans in-game seem to be dead. No the coding clans aint dead, was ignoring the question about Tripwire personally as someone already gutted it out and reposted it as .. Hmm don't remember the name PS or something. I would say go through the scripts and some scripts you shouldn't delete as its how it cures.. but best idea is to make sure to keep backups and not just save profile REAL backups. SAVE PROFILE AS - name it like backup(date)(time) as sometimes the rollback doesn't work right. I figured I could just do away with most of the curing, right? Firstaid is pretty robust these days, right? These are real questions, I honestly don't know anymore. It has pre-resto now, I've heard. Is there anything that Firstaid doesn't cover? Edit: Trial and error, I guess, like everyone else. Alright! Thanks, I'll just try that. I'd also say that how first aid handles curing bleed is inefficient, UT that isn't hard to turn off and code curing yourself. So, using the web client (the one at http://client.aetolia.com/ ), there is a built in targeting system that lets you choose a target using the tab key. You can call the variable it sets with @tar in various aliases and the like. I would like to also be able to set this variable manually, rather than using the tab key. Am I just out of luck? Using @set tar does nothing other than create a new variable named tar with that value that using @tar doesn't work with. Have you tried --> settarget tar -target-? That sets a target in Aetolia itself, the web client's targetting system is completely separate from that. I'm trying to figure out how to do this in the client and can't get it to work. Using @set tar still doesn't seem to work, it is creating a new variable named tar and giving it the value rather than setting the target variable. So, With the new WHO it seems to be messing up with my system code..
the 'blank spaces' are ALOT of blank spaces but somehow it doesn't show after I click post. Then run the second wildcard through a white space trim command. Cursory google search points me at :match( "(.-)%s*$" ) for trimming trailing white space. Thanks @Keroc I just added the trimming to my matches and it works a dream! I stayed with my own triggger and just used matches:match( "(.-)%s*$" ) .. I should have looked in my Mudbot who settings to find it but it was driving me nuts and thinking was going out the window ..